Despite the recent fluctuations in the weather due to climate change, the winter weather conditions are still abysmal for many regions across the United States. Severe weather can creep in on us when we least expect it, making clearing off our cars a hassle and driving in it extremely dangerous. Even if you’re a seasoned driver who’s been on the road for years, everyone can use a refresher course when it comes to surviving the nasty winter weather, so without further ado, let’s jump right into it! Make sure your tires are inflated to the proper PSI (tire pressure) before embarking on any winter driving. It’s a myth that under-inflated tires will help you save on gas and help you drive better on icy roads; under-inflated tires actually just put more strain on the vehicle, and can result in unbalanced turns. Unbalanced turns are the last thing you want when driving in the ice and snow. If you hit any icy patches on the road, don’t step too hard on the brakes, and don’t put your car in neutral. If your car begins to slip and slide across the ice, ease off the gas, slowly tap the brakes, and steer your car to match the direction that the rear of the vehicle is already sliding in. And remember, don’t panic. 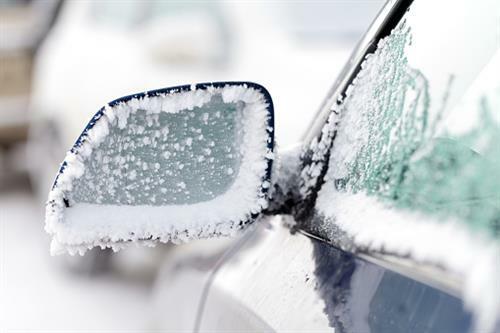 When the weather drops drastically, the possibility that the locks on your car will freeze solid increases. To avoid being stranded, keep a small bottle of deicer or hand sanitizer on your key ring. Both will unfreeze your locks when you squirt the solution into them. Also, keep at least a half a tank of gas in your vehicle when the cold weather reaches below freezing; doing so will prevent your gas tank and fuel lines from freezing up. Don’t use cruise control when driving on icy (or snow-covered) roads. When driving on slippery roads, you want to aim for having full control over your vehicle. Using cruise control may cause you to instinctively tap your brakes when driving over the ice when trying to turn it off. Before going on a big trip, check two things: the weather report, and your car’s exhaust pipe. Make sure the exhaust isn’t clogged with a buildup of snow, ice, debris or dirt. An exhaust pipe that’s clogged up could cause carbon monoxide gas to leak into the vehicle. And, as always in the wintry weather, drive as slowly as possible. Pressing the gas slowly to accelerate and easing off it when stopping is the best way to retain traction. Take more time to slow down for all traffic lights and stop signs. Top Driver is the first state-approved driving school in Illinois to be licensed for online driver’s ed, and is one of the largest driver’s education schools in the Midwest. Top Driver also provides education and training for drivers in Ohio and Michigan. Interested in driver’s ed for you or for a teen in your family? Give us a call today at 1-800-374-8373. This entry was posted in Top Driver Blog and tagged Driving School, Top Driver, Winter Driving, Winter Driving Tips.